It has been suggested that this article be merged into Christian liturgy. (Discuss) Proposed since November 2018. A church service (also called a service of worship, or simply a service) is a formalized period of Christian communal worship, often held in a church building. It often but not exclusively occurs on Sunday, or Saturday in the case of those churches practicing seventh-day Sabbatarianism. The church service is the gathering together of Christians to be taught the 'Word of God' (the Christian Bible) and encouraged in their faith. Technically, the "church" in "church service" refers to the gathering of the faithful rather than to the building in which it takes place. In most Christian traditions, services are presided over by clergy wherever possible. 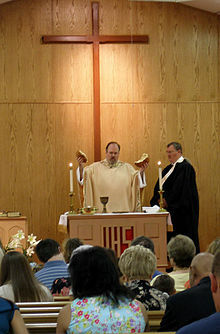 Styles of service vary greatly, from the Anglican, Eastern Orthodox, Oriental Orthodox, Presbyterian, Roman Catholic, and Lutheran traditions of liturgical worship to the evangelical Protestant style, that often combines worship with teaching for the believers, which may also have an evangelistic component appealing to the non-Christians or skeptics in the congregation. Quakers and some other groups have no formal outline to their services, but allow the worship to develop as the participants present feel moved. Today a wide variety of church services exist, from the long and elaborate services of Eastern Christianity to the very basic Evangelistic sermon. Though the majority of services are still conducted in church buildings designed specifically for that purpose, some services take place in "store front" or temporary settings. For those unable to attend a service in a church building a burgeoning televangelism and radio ministry provides broadcasts of services. A number of Websites have been set up as "cyber-churches" to provide a virtual worship space free to anyone on the Internet. Church services are often planned and led by a single pastor or a small group of elders or may follow a format laid out by the dictates of the denomination. Some churches are "lay led" with members of the congregation taking turns guiding the service or simply following format that has evolved over time between the active members. A few begin their church services with the ringing of a bell (or a number of bells). The service usually involves the singing of hymns, reading of scripture verses and possibly a psalm, and a sermon. If the church follows a lectionary, the sermon will often be about the scripture lections assigned to that day. 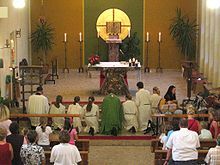 Eucharistic churches have usually Holy Communion either every Sunday or several Sundays a month. Less liturgical congregations tend to place a greater emphasis on the sermon. Vocal music is traditionally sung by a choir or the congregation (or a mixture of the two), usually accompanied by an organ. Sometimes other instruments such as piano, classical instruments, or modern band instruments may be part of the service, especially in churches influenced by the contemporary worship movement. Some churches are equipped with state-of-the-art multi-media equipment to add to the worship experience. The congregation may sing along in hymnals or words to hymns and worship songs may be displayed on a screen. More liturgical denominations may have the words to specific prayers written in a missalette or prayer book, which the congregation follows. Many churches will take up a collection during the service. The rationale for this is taken from 1 Corinthians 16:1-2, 1 Corinthians 9:9-11, and 1 Timothy 5:16-18. But some churches eschew this practice in favor of voluntary anonymous donations for which a box or plate may be set up by the entrance, or return-address envelopes may be provided that worshippers may take with them. Some churches offer Sunday school classes. These will often be for younger children, and may take place during the whole of the service (while the adults are in church), or the children may be present for the beginning of the service and at a prearranged point leave the service to go to Sunday school. Some churches have adult Sunday school either before or after the main worship service. Following the service, there will often be an opportunity for fellowship in the church hall or other convenient place. This provides the members of the congregation a chance to socialize with each other and to greet visitors or new members. Coffee or other refreshments may be served. Wikimedia Commons has media related to Church services.